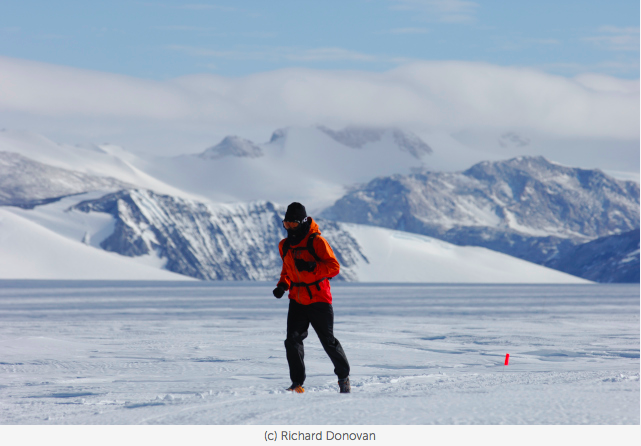 The first marathon at the North pole occurred in 2002 when Richard Donovan covered the distance alone. Since then, Richard organizes the North Pole Marathon every year. In addition to organizing the world’s northernmost marathon, he also organizes the world’s southernmost marathon, the Antarctic Ice Marathon. Richard is a 46-year-old Irish runner and marathoner who has completed some of the most diverse ultra-marathon races on earth. His races cover not only vast distances, but take place in a variety of extreme climatic conditions and circumstances: from the mind-numbing cold of the South pole to the scorching heat of the Sahara Desert; from the sea level of native coastal Ireland to the altitude heights of the Andes and Himalayan mountains; and from baking sand dunes to snow and ice. He worked previously as an economist. His life radically changed in 2002, when he ran seven ultra-marathons on seven continents within the space of a year. He then decided to dedicate his life to running activities. In the past ten years, he has won several off-road events, such as the Antarctic Ice Marathon, the Inca Trail Marathon, the Everest Challenge Marathon, the Antarctic 100kms, and the Himalayan 100-Mile Stage Race. Between January 30 and February 5, 2009, he set a world record for running seven marathons on each of the seven continents in fewer than six days, spending almost half of this time in the air getting from one marathon destination to the other! In February 2012, he improved his own record by completing seven marathons on seven continents in 4 days 22 hours and 3 minutes (the World Marathon Challenge 2012). 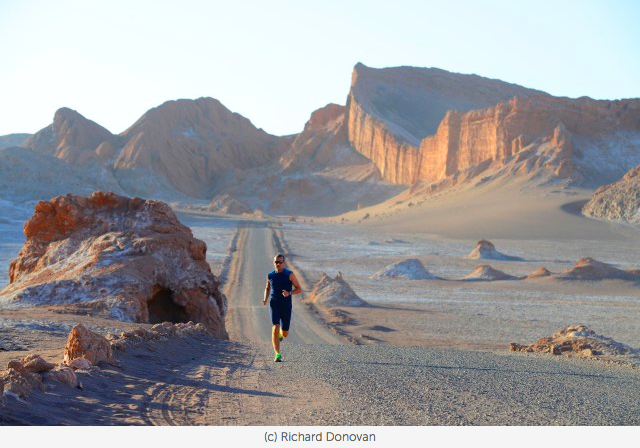 Interview of an exceptional extreme runner, Richard Donovan, thanks to whom we will get to run the North Pole Marathon on April 9, 2013. Why have you decided to run a marathon at the North pole in 2002? In 2002, I had set a big goal to run seven difficult ultra-marathons on seven continents in one year. That is why, on January 22, 2002, I participated in the inaugural – and only – South Pole Marathon. This marathon has never been organized since. There were only six competitors registered, and three of them decided not to run after spending some time in the Antarctic! The race was difficult because of the temperature (-50°C) and the altitude (9000 feet). And we faced huge logistical problems (Richard finished first). A few weeks after the race, I heard that the second placed finisher, Dean Karnazes, was planning on running a marathon at the North Pole. I wanted to get to the North Pole before him to be the first person to run a marathon at the North Pole. I succeeded in doing so and ran a solo marathon at 90°N on April 5, 2002. A Russian copter dropped me off, and I just repeated a circular route. We recorded the distance with GPS. Dean Karnazes must have decided not to run a marathon at the North Pole but this “friendly” competition with Dean was a large part of my decision to run there. I also knew that this was an opportunity to be the first to run a marathon at both poles. How did the North pole compare to the South pole? It was actually colder at the North Pole that year because of very strong winds, but it felt much less severe because there was no altitude. The landscape at the North Pole is quite different in that you have all these small little ice hills, while the South Pole has much more level terrain. But in general, the run at the North Pole seemed quite easy compared to the South Pole Marathon. It took me a while to recover from the general weakness I experienced after the South Pole trip. Clearly, the big difference is the altitude. At the South Pole, just trying to move is awful. It’s just not built for people to try to do distance runs. Which edition of the North Pole Marathon was the most difficult? Probably the 2006 race. It was not very cold but the surface was so uneven that the race was extremely difficult. The terrain was quite trying, comprising deep snow in patches and a very uneven and unpredictable surface, making it difficult to get a rhythm going. Do you think that the North Pole Marathon could be jeopardized by the Arctic icemelt? During the past couple of years, there were more and more competitors. The economic crisis has had no impact. And I think that the Arctic ice melt will certainly have no impact in the short term. This problem is peripheral but does not so far significantly impact the geographic North Pole itself even if the ice is less and less thick. But clearly, the Russian base camp Barneo is now set up for a few weeks only whereas it was set up for a longer period when I began to organize the North Pole Marathon in 2003. And, it is more and more difficult to find an ice block to build the runway for the Antonov. 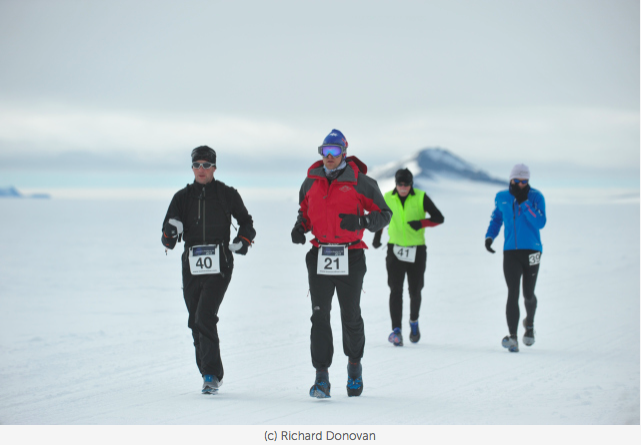 How do you prepare an extreme race as the North Pole Marathon, the Antarctic Ice Marathon, the Antarctic 100kms, or the World Marathon Challenge 2012? I prepared the World Marathon Challenge 2012 in a few days only!! I am used to running 90-100 miles a week so I do not need any specific preparation before an events like that. My legs and muscles have memories. I usually have no time to do a specific preparation. It was only in mid-January, 2012 – as I was going to Antarctica anyway at the end of January – that I decided to run seven marathons on each of the seven continents in less than five days on the way home. I started the World Marathon Challenge 2012 in Antarctica on February 1st, 2012! The marathons on the continents were more a logistical challenge than a physical challenge. Running was the easy part! However, the World Marathon Challenge 2012 required a physical demand too, but in a different manner than the other extreme races you mention. I commenced a marathon in Antarctica on February 1, 2012 several hours before a Russian cargo plane’s scheduled return flight to Cape Town. At Cape Town, I had app. 9 hours to disembark the plane, leave the airport, run the marathon and return to check in for my next flight to Sao Paulo. In Brazil, I had even less time, 8 hours and 50 minutes. One late flight would have scuppered the entire record attempt. I was unable to stay anywhere en route and suffered from major sleep deprivation. I slept little even during flights. Marathon fatigue and flying fatigue accumulated. The impact of extreme temperature fluctuations are also a factor of fatigue with a substantial difference in temperature between the marathons. How many marathons and ultra-trails have you run? Which one did you like best? I have no idea…a lot!! I began to run marathons and ultra-marathons in 2002. The only race I have participated before 2002 was the Marathon des Sables as a once-off in 1999. The Jungle Marathon in Brazil is very nice. The environment is fantastic. It was a unique experience. I also like the Trans 333 across the Sahara Desert in Africa. The Inca Trail in Peru is really nice too. There is a high altitude (14000 feet). What is the most difficult race to which you have participated? The Jungle Marathon because I became dehydrated and suffered acute renal failure (kidney failure). I recovered however. And there is no protection against animals. It gets you to run faster!! Do you practice other sport activities? I played rugby when I was younger. I practice boxing a few days a week. I do not have much time for other sports. What are your future projects? Last month, I was in Chile. 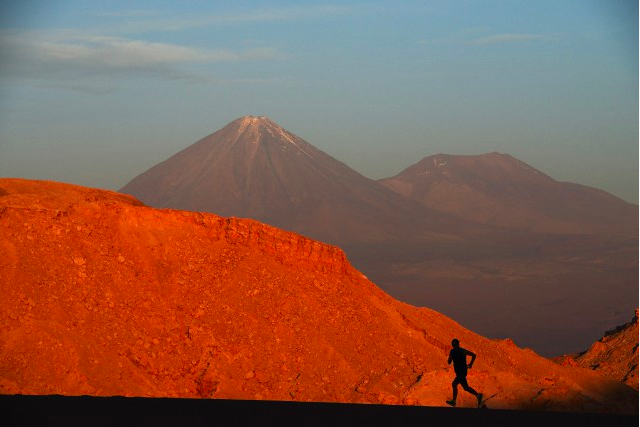 I am about to organize a “volcano marathon” at San Pedro de Atacama (18000 feet). Two races would be proposed to the competitors: a 100kms and a marathon. It would be the highest marathon in the world. I also have various polar projects. I would like to organize a race in Antarctica combining skiing, cycling and running that would take place at the same location as the Antarctic Ice Marathon. I also plan to run across Antarctica in December 2013. Entretien réalisé par Runners to the Pole en décembre 2012.